© Copyright 2015, LunarG, Inc. Figure 1. The SPIR-V Binary Intermediate Language. The first 5 slots form the header. The remaining slots hold a linear sequence of variable-length instructions (one per color in the figure). Each instruction starts with a word that encodes the instruction’s opcode and size, followed by a variable number of 32-bit operands. Abstract. SPIR-V is a new platform-independent intermediate language. It is a self-contained, fully specified, binary format for representing graphical-shader stages and compute kernels for multiple APIs. Physically, it is a stream of 32-bit words. Logically, it is a header and a linear stream of instructions. These encode, first, a set of annotations and decorations, and second a collection of functions. Each function encodes a control-flow graph (CFG) of basic blocks, with additional instructions to preserve source-code structured flow control. Load/store instructions are used to access declared variables, which includes all input/output (IO). Intermediate results bypassing load/store use single static-assignment (SSA) representation. Data objects are represented logically, with hierarchical type information: There is no flattening of aggregates or assignment to physical register banks, etc. Selectable addressing models establish whether general pointers may be used, or if memory access is purely logical. A provisional SPIR-V specification was released March 3rd, 2015 by Khronos. It contains the full instruction set and specification, and can be used as a reference while reading this paper. Figure 2. SPIR-V serves as a common single language for multiple languages feeding multiple drivers. It can also target other languages. It is fully defined by Khronos, and can natively represent the features needed by graphical shaders and compute kernels. high-level enough to be device independent and to not lose information needed for maximum performance on the target device. How does SPIR-V meet common expectations of an intermediate language (IL)? Enabling shared tools. There is no need for every hardware platform to provide its own high-level language translator. Such translators can be much fewer in number than the compiler back ends SPIR-V will feed. A single tool set for a single ISV. An individual ISV can generate SPIR-V with a single tool set, eliminating all issues with portability of the high-level language. Policies for qualifier defaults, inheritance, etc., are gone. Everything is explicit (precision, row_major, stream number, etc.). No function overloading or resolution; call sites identify the specific function instance to call. Only one compilation unit; multiple compilation units that need to merge to form a single executable will be merged by a front end. The variable name space is flat; there are no nested scopes. Your mileage will definitely vary. How much SPIR-V should be optimized before entering the run-time driver is discussed further down. Note that a typical optimizing run-time compiler will execute register allocation and scheduling transformations specific to the target system. These transforms tend to be computationally expensive and can only be done in a platform-specific compiler layer (back end). SPIR-V is fully set up to support multiple source languages. It includes all the features needed to support shipping GLSL shaders, OpenCL C kernels, and support for C++ is progressing. SPIR-V also enables development of new experimental languages. SPIR-V is sufficiently far removed from source code that a significant explicit step is required to recover the original. Without tools, its raw binary form is difficult to read or modify. Self Contained: Khronos fully defines SPIR-V in Khronos specifications. Native Representation: SPIR-V contains, natively, the constructs needed to represent the functionality in Khronos source languages, including objects like matrices and images. Simple: Tool sets need to find SPIR-V binary form simple to read and process. This is achieved through a highly-regular linear stream of words. Instructions encode their size, making it easy to process just the instructions of interest while skipping irrelevant (or unrecogized) instructions. New instructions can be added through extensions without breaking existing tools. Binary Representation: SPIR-V is the binary form that an API entry point will accept, to eliminate all need for parsing and string processing in the driver. Easy to Convert to other IRs: SPIR-V is a relatively high-level IL, preserving all vital information from the source language needed to translate it easily to existing intermediate representations drivers are likely to have in their stacks. It is higher-level than some existing graphical ILs, preserving more information that allows translation to higher-performance run-time code. Tools are written to only process instructions they understand, skipping others, making it easy to extend SPIR-V without breaking tools. The OpExtension instruction declares extensions that semantically require processing new instructions. Sets of extended instructions can be provided and specified in separate specifications. This is done for core versions of graphics and OpenCL modules, for operations like sin, cos, min, max, exp, etc. Reserving (registering) vendor-specific ranges of enumerants. So, the above list should be avoided in off-line transforms of SPIR-V meant to be portable across devices. Instead of doing such undesirable optimizations off line, SPIR-V has optimization control enumerants for loops, functions, and branches that allow communicating, say, that a loop is faster if not unrolled, based on some knowledge not present in the module itself. Such controls should be respected by target devices. See, for example, DontUnroll or InLine in the specification. For an example of a graphics shader, see the example in the SPIR-V specification. SPIR-V is based on each type declaration, each variable, each operation result, etc., getting a unique name: a result <id>. No result <id> can be re-targeted by another different instruction, and all consumed <id>s are defined somewhere as a result <id>. Thus, any consumed <id> will have exactly one place it is defined. Text outside of a listing, including the specification, refer to this opcode as OpTypeInt, but it is shortened to just “TypeInt” in the disassembly, where it is clear it’s the opcode. Above, PrivateGlobal is a storage class, of which there are many, including the Function storage class for function local variables. Some storage classes are for IO and, fundamentally, IO will be done through load/store. Also, note the store instruction does not have a result <id> that participates in the SSA name space. The above example also introduce result types which are the second number on some lines. These are the type of the result of the instruction, and refer to the <id> of the appropriate type declaration. An important, intentional, side effect of each <id> defined by exactly one instruction, is that SPIR-V is always in single static assignment (SSA) form. The SSA from of SPIR-V is defined in terms of the result <id>, and not memory loads and stores. This standard form is in common use now, and there is quite a bit of information available for it. A common optimization would be to eliminate unnecessary loads and stores, making more use of intermediate objects instead. For IO storage classes, the initial load and final store can never be eliminated. However, for many variables, the memory could be completely eliminated by removing all loads and stores for them. Decorations are declared early, as a forward reference, so that when the object or type is actually made, everything is known about it. SPIR-V also identifies built-in variables from a high-level language with OpDecoration, where the decoration is Built-In, followed by which built-in variable it is. This assigns any unusual semantics to the SPIR-V variable. Generally, the variable behaves and is operated on within SPIR-V based on it’s actual declaration, not as a special built-in variable. They are declared and treated the same as any other variable in SPIR-V.
Types are built up, by each module from (parameterized) scalars. A floating-point or integer scalar type (OpTypeFloat or OpTypeInt instruction) takes an operand that says how many bits wide it is, and validation rules say which sizes are allowed for which execution models. Vector types (OpTypeVector) have an operand for what type the component is, and how many components it has. Structure types take a list of member types, etc. Types are parameterized and built up hierarchically, one instruction at a time. There are no built-in aggregate types. This is best demonstrated in the Type Graph figure. Figure 3. Type Graph. 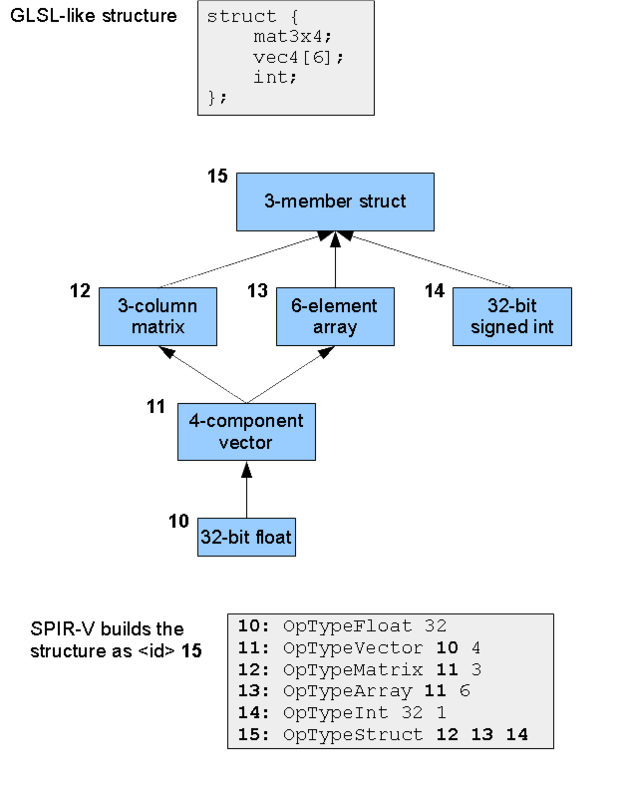 The SPIR-V instructions build the given GLSL-like structure, and assign it an <id> of 15 for later use. As if all integers are “signless”, meaning they are neither signed nor unsigned: All OpTypeInt instructions select a signedness of 0 to conceptually mean “no sign” (rather than “unsigned”). This is useful when translating from a language that does not distinguish between signed and unsigned types. The type of operation (signed or unsigned) to perform is always decided by the opcode. As if some integers are signed, and some are unsigned: Some OpTypeInt instructions select signedness of 0 to mean “unsigned” and some select signedness of 1 to mean “signed”. This is useful when signedness matters to external interface, or when targeting a higher-level language that cares about types being signed and unsigned. The type of operation (signed or unsigned) to perform is still always decided by the opcode, but a small amount of validation is done where it is non-sensible to use a signed type. Note in both cases all signed and unsigned operations always work on unsigned types, and the semantics of operation come from the opcode. SPIR-V does not know which way is being used; it is set up to support both ways of thinking. There is a built-in non-numeric Boolean type (OpTypeBool). This type is the result of instructions doing relational testing (e.g., OpSLessThan), with true or false being the possible values. These are also the required type of operand to logical instructions (e.g., OpLogicalOr). Different source languages or target architectures have differing numeric definitions of true and false. When interfacing between such definitions and the SPIR-V Boolean type, OpSelect can be used to convert to arbitrary true and false numeric values, or comparisons can be done (e.g., OpINotEqual) on numeric values to convert to SPIR-V’s Boolean non-numeric true and false values. One way SPIR-V increases portability is explicit operation. High-level languages, for convenience, make great use of implicit type conversion and implicit operation inference, which also makes portability more difficult. There were three inferences: 1) a type conversion, 2) operation semantics, 3) a resulting type. In more complex expressions involving more types, this is fragile, and sometimes subject to different interpretations. SPIR-V instructions do not, however, encode the full type of their operands. Here, as usual, take “type” to include the bit width of scalars/components as well as number of components in a vector, etc. Many opcodes can operate both on scalars or vectors, typically with all the operands and the result being the same type. These opcodes also operate on multiple bit widths (e.g., 32-bit floats or 64-bit floats). Effectively, bit-width information and component-count information typically comes from the operands' type and the result type, not from the opcode. the result type is correct for the operation (e.g., a dot product results in a scalar). The SPIR-V specification says for each opcode what must be true in a valid module. For our example here, it says 16, the type of 20, and the type of 21 must all be unsigned integer types, all of the same width, and in this case, all scalars. The result in arguably redundant information, but less inferencing means simpler algorithms and faster load times at run time. Finding the right overloaded function in the face of implicit conversions is also quite tricky, and something SPIR-V avoids. The SPIR-V function-call instruction explicitly says the <id> of the function definition to use. A direct call is not done by name string, function signature, or any other kind of matching. It is direct and explicit. When using the link capability of SPIR-V, linkage names will used along with import/export decorations to enable function calls across modules. Branches include conditional and unconditional branches, switch, kill, and return instructions. There is no other way into a block than a branch to its beginning, either from being the first block in a function or having an explicit branch to it. There is no other way out of a block than the branch at the end. Blocks always end in a branch; there is no fall through to the next block. Branches can be conditional (two choices), or unconditional (one choice) or switches (many choices, labeled with constants). They also include return statements. The set of blocks and branches form a traditional control-flow graph (CFG), which is a directed graph that allows many topologies for looping and selection. It is often desirable to represent structured flow control, meaning, roughly, the type of nested control-flow structure allowed by the C language, without using gotos, but still allowing breaks, continues, and early return statements. Effectively meaning flow must be strictly nested, except for jumping out of the nesting by one or more levels. Many high-level languages allow representing structured flow control, and it is helpful for back ends of parallel-execution architectures to know it is present. Allowing arbitrary rearrangement of the CFG can lose this desirable information. Hence, SPIR-V allows the CFG to be annotated to allow representation of structured control flow. This is done by recognizing when nested control splits, it must merge again, and it is the pairs of splits and merges that nest. Figure 5. Nesting CFG for Structured Source. Below is the example corresponding SPIR-V for the above. Loop breaks would also branch to the loop merge point. Note: Khronos is currently considering whether to further restrict structured loops to just “infinite” do loops containing breaks, rather than supporting the above “for” loop topology. 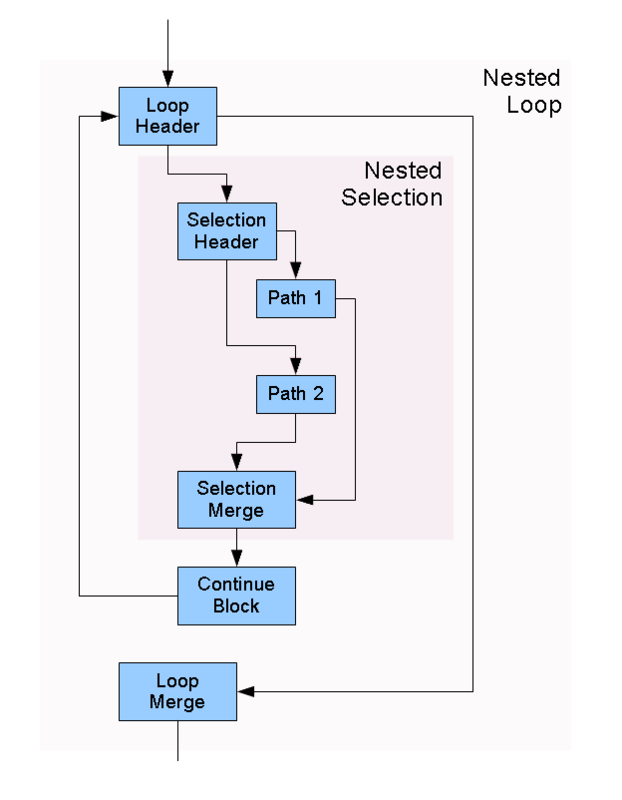 Header blocks declare their merge points (blocks) with the OpSelectionMerge or OpLoopMerge instruction. The header and merge blocks bracket a nested construct, defined through dominance and post dominance of the construct’s blocks. Breaks, continues, and early returns can bypass a nested structure’s merge block. Preserving structured control flow is optional from a SPIR-V perspective, but there are vertical paths that will require it. For example, going from GLSL down to hardware-specific shaders will require preserving the structured control flow from GLSL, through SPIR-V.
To make a function, you first need a function type (OpTypeFunction) that gives types to parameters and a return value. A function definition (OpFunction) then refers to this type. To call a function defined in the current module, use OpFunctionCall with an operand that is the <id> of the OpFunction definition to call, and the <id>s of the arguments to pass. All arguments are passed by value into the called function. This includes pointers, through which a callee object could be modified. A forward function call is possible in part because there is no missing type information: The call’s result Type must match the return type of the function, and the calling argument types must match the formal parameter types. A function definition’s parameters each get their own instruction declaring them (OpFunctionParameter), giving <id>s to the formal parameters used within the definition’s body. This is in keeping with every <id> being defined in exactly one place. Such instructions can be removed from a module without changing its semantics; they are for debug-style information only. Specialization enables creating a portable SPIR-V module outside the target execution environment, based on constant values that won’t be known until inside the execution environment. For example, to size a fixed array with a constant not known during creation of a SPIR-V module, but is known by the time a driver lowers that module to its target architecture. Decorate 50 SpecId 42      // the "constantId"
Now, the module above has a default size of 12 for the array (the constant value for <id> 50). If no specialization is applied, 12 will be its size. The module now is now specialized. SPIR-V fully supports pointers, in all their (ugly) glory. Variable declarations (OpVariable) result in a type that is a pointer to them, for future load/store. General arithmetic and type casting can be performed on such pointers, resulting in new pointers that do not point to declared variables. This functionality is required by OpenCL. However, key graphical-shader programming models do not expose pointers, do not support general arithmetic on them, and do not want them in registers at the machine level. This programming model is also fully supported. Which style of pointer is declared early in the module through the Addressing Model operand of the OpMemoryModel instruction. It can be Logical to enable the graphical-shader programming model, or Physical32 or Physical64 to enable the full pointer model needed by OpenCL. When the Logical Addressing Model is used, the result of a variable declaration (OpVariable) can instead be considered a reference or handle to the variable, rather than its address. In fact, the resulting pointer has no numeric value and cannot be arithmetically manipulated or cast to a numeric type. The pointer types also have no bit width, and variables cannot be made in memory that would hold a pointer. For either style, to access a part of a composite object, say a structure containing an array, use OpAccessChain, which gives a chain of indexes to walk the type’s hierarchy. Let’s say we want to access the the z component of element 4 of the array in the Type Graph figure. Note that <id>s (not literals) are used for indexing to support variable indexes (allowed for arrays, not for structures). A physical-pointer model might have memory layout information that allows turning such an OpAccessChain into an address computation. However, the logical addressing model will not, and <id> 72 simply remains as a logical statement of how to walk the structure, and not an address computation. atomic operations, unified across atomic counters, images, etc. geometry shader primitive emit vertex, end stream, etc. There are multiple ways of extending SPIR-V from the core specification. SPIR-V can import an extended instruction set (OpExInstImport). An extended instruction set is typically associated with a particular source language to provide, for example, built-in functions from that source language that are not represented by the core SPIR-V instruction set. Extended instruction sets are specified in separate documents from the core specification. While the semantics of the core instructions are intended to be the same for all source languages, other operations have semantics that vary across source languages. For example, the performance/accuracy trade-offs of trigonometric and exponential built-in functions like atan() or pow(). Or, the behavior of NaN operands in min() or max(). Rather than having modes in SPIR-V that modify the behavior of such operations, or having many different min, max, pow, and atan core instructions, these instead are kept unique through extended instruction sets, where each document specifies the correct semantics for its extended instruction set. This allows mode-less SPIR-V → SPIR-V transforms that know the semantics of the extended instructions. 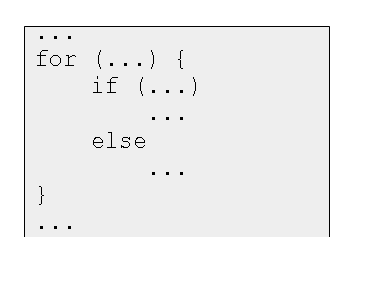 An extended instruction could also represent some operation other than something that looks like a function in the source language. It could be a syntax/operator driven operation, or even a built-in variable. In the above, the “built-in functions” referred to are meant to be intrinsic to the source language, rather than libraries. Libraries are quite different, and discussed in the next section. Tools expected to process extended instructions must know the semantics of the instruction to the same extent they would know the semantics of core instruction they operate on. This is in contrast to an external call to a library function, where all that would be known would be the signature and possibly memory characteristics of the function. Extended instructions are called by number, not by name. Other than the name of the extended instruction set itself, there is no string processing. These numbers are part of the specification of the extended instructions, and must be shared by at least the front end creating SPIR-V and the back-end lowering it to a target instruction set. That is, they are not black boxes; they are known as well as the core instructions. 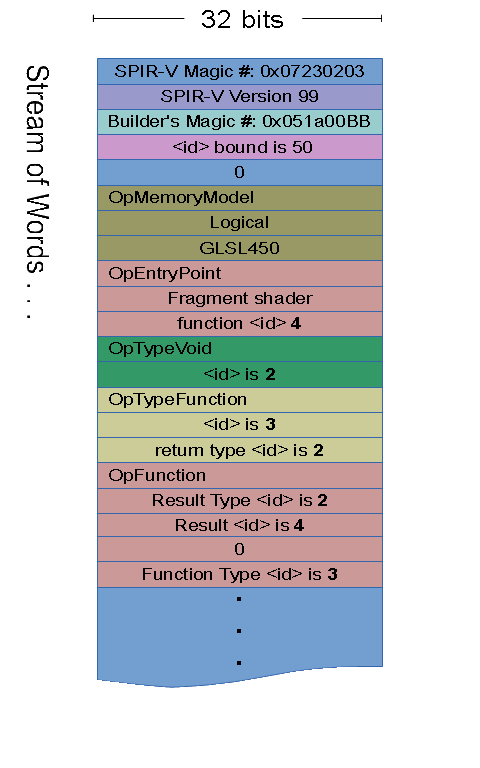 In the above, it is simply known that extended instruction 28 in the GLSL.std.450 instruction set means the GLSL semantics for the built-in sqrt(). This is known from the extended instruction specification just as well as it is known that core instruction 122 is OpIAdd. Currently, in graphical shading languages, there are no libraries of functions to call, only intrinsic built-in functions, or possibly separate compilation units of function bodies. Further, for graphical shaders, one SPIR-V module represents an entire stage of a graphical-shader pipeline: All compilation units for that stages must be linked together by the front end for that language, making a single SPIR-V module. Thus, as graphical shading languages stand today, they do not link to external libraries of unknown semantics, and this section does not apply to them. OpenCL source languages, however, support multiple compilation units, where external functions and variables can be imported and exported. Libraries, for example, make use of separate compilation units. This is represented in SPIR-V using multiple modules that are subsequently linked together. Within a module, use the Linkage Type decoration on functions and variables to decorate them as being either definitions to Export, or declarations to Import. Linkers will subsequently link symbols by an exported name string. Traditional-style extensions can also be added to SPIR-V. It is easy to extend all the types, storage classes, opcodes, decorations, etc. by adding to the enumeration tokens. Of course, if done independently by two parties, this would cause some obvious conflicts. So, vendors wishing to write extensions to SPIR-V can register for a range of enumeration values to avoid conflict. Use of such extensions must be declared near the beginning of the module, using the OpExtension instruction. Extending SPIR-V through OpExtension is not necessarily the same thing as the source language using an extension. It is quite possible that core SPIR-V has all the features needed to support some source-language extensions. For debug purposes only, extensions used at the source-language level can be documented in a SPIR-V module using the OpSourceExtension instruction. If such a source extension does require a SPIR-V extension, that is a separate thing, a SPIR-V extension, which still must be declared through the OpExtension instruction.